The microS sensor exclusively from MSE is a miniature sensor used to measure the shear stress that a fluid imparts on a wall along which it’s flowing. Wall shear stress is the source of what is commonly known as “skin friction”, which, on airplanes and large ships, can be a significant factor against fuel economy. The microS sensor employs holographic beam shaping technology to project an angular “fan” of laser beams into space. 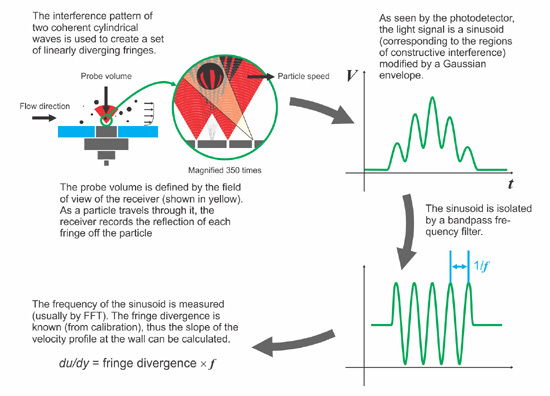 Holographic optics are also used to aim the receiving channel so that the measurement performed is extremely close to the surface of the sensor. A holographic optic is a lens with features on it that are smaller than the wavelength of light. When light enters a medium such as glass or water, its speed is decreased. The “index of refraction” of a medium is a relative measurement of the speed of light as compared to that in a vacuum—the higher the index, the lower the speed of light. This means that small pieces of glass can be used to “slow down” part of the wave so that, when it emerges it can interfere with other parts of itself. The result is an amazing capability to “shape” laser beams. In the microS, a proprietary optic creates a precise fan of laser beams (see figure) and a very narrow observation region very close to the face of the sensor. This means that, when mounted flush with a wall, the receiver will be looking extremely close to the wall in such a small range that the velocity profile of the fluid is linear (deep in the “boundary layer”). The math works out in such a way that the frequency of the resulting signal is then directly proportional to the change in velocity as a function of distance from the wall (du/dy, or the “velocity profile”). If the fluid viscosity is known, the shear stress can be calculated since shear stress = fluid viscosity x velocity profile. Additionally, the fringe fan in the microS is “biased”, or tilted to one side. 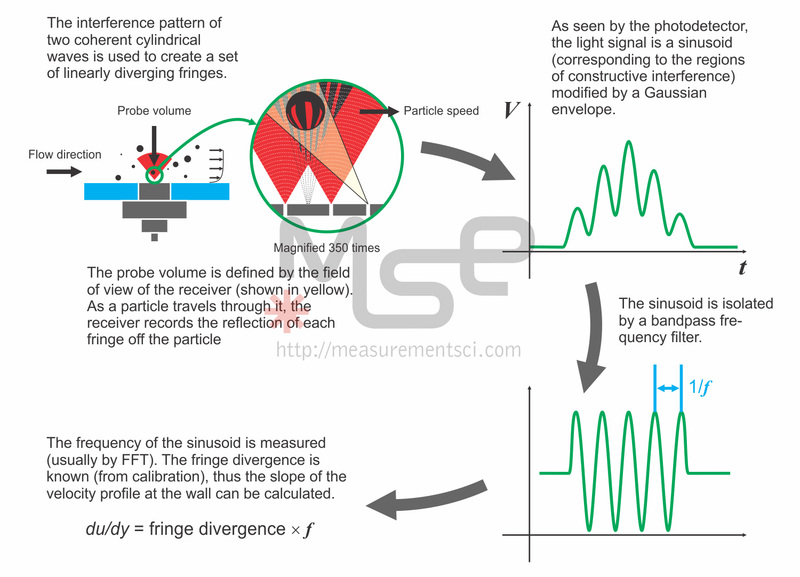 That makes it such that the shape of the sinusoidal signal is different depending on which direction the particles are traveling, so the microS is also ideal for studies of flow separation where the velocity profile changes sign. Whereas in an LDV/LDA fringe divergence is the enemy of precision, in the microS it is the primary characteristic. The sensor is based on a technique first developed by Naqwi and Reynolds using conventional optics (A.A. Naqwi and W.C. Reynolds, “Dual cylindrical wave laser Doppler method for measurement of skin friction in fluid flow,” Report No. TF-28, Stanford University, 1987). MSE combined this clever concept with holographic optics to create a one-of-a-kind sensor suitable for small spaces, instrumentation, and field testing.